On May 1, 2018 during the Craft Brewers Conference, Brewery Finance will crash one of Nashville Tennessee’s coolest weekly music traditions: Honkytonk Tuesday at American Legion Post 82. Each Tuesday night Post 82 hosts Music City’s best out-of-the-mainstream and authentic country music acts. 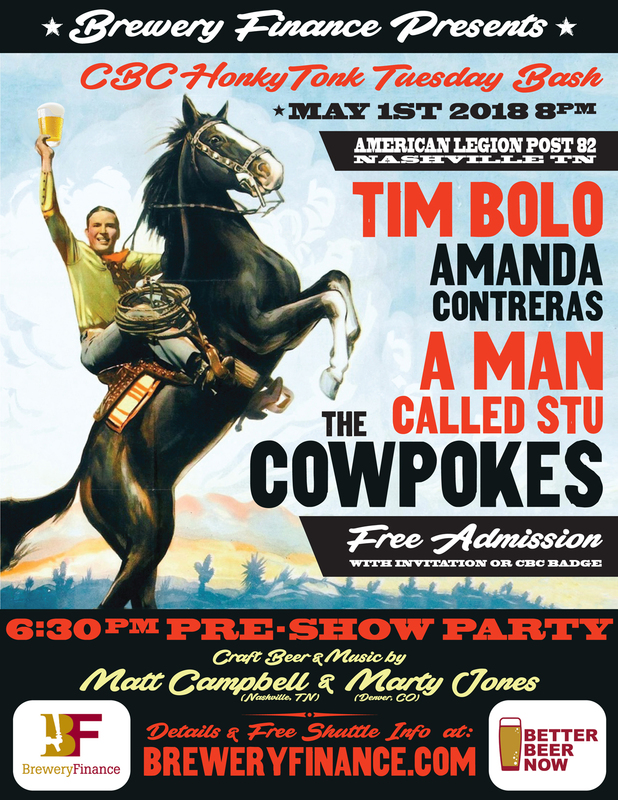 The May 1 Honkytonk Tuesday starts at 8 PM and features sets by Tim Bolo, Amanda Contreras, A Man Called Stu, and The Cowpokes. Admission is free with an invitation from Brewery Finance or a Craft Brewers Conference badge. Starting at 6:30 PM, Brewery Finance will host a pre-show party with complimentary beer and music from the Matt Campbell Band (Nashville, TN) and Marty Jones (Denver, CO). Post 82 is located at 3204 Gallatin Pike in Nashville, just a 10-minute drive from the CBC location. For easy transportation to and from the event, Brewery Finance is providing complimentary rides via an Anchor Transportation shuttle. It will pick up honkytonking CBCers on the 5th Avenue side of Music City Center (at 201 5th Ave. South) starting at 6 PM. For every CBC guest who flashes a CBC badge or pre-show invite when entering the concert, Brewery Finance will donate $5 to Post 82’s operations fund. We hope you can join us for a unique night of true-grit, All-American music in Nashville. Note: There will be no Taylor Swift, Florida Georgia Line or other mass-market “country” songs performed at this event. Just the real-deal, small-batch good stuff.